Husband Walter and I today enjoyed one of our favorite Smoky Mountain camping activities, sitting together in the cool morning temperatures, Walter with his coffee and me with my hot tea. The only thing missing was the campfire, which was a good thing because we were sitting at home on our screened porch. Temperatures of about 63 degrees and a brisk breeze followed a night and morning of rain. It was quite a bit milder than the high 70s and low 80s that have been feeling a lot hotter because of high humidity. I even had to go back inside and get a light jacket. The sun was out later, and the thermometer on our porch read just over 70. By late afternoon it was back down to 63. Right now (8:30 p.m.) it is just under 60 degrees. Ah, it is good while it lasts, maybe a few more days of no furnace or air conditioning running! In memory of our Smoky Mountain moment, I piled up rocks for a photo shoot. I do love subjects that stay still for my picture snapping. Those pictured above are just a few from my “collection” assembled through years of Skupien travels. Other people buy souvenirs; I like rocks. Don’t do anything with them; can’t remember where I picked up most of them; don’t spend any time classifying them--or doing anything at all with them. But I still transport them home with the care other people would give precious gems. Well, maybe not quite that much care. Walter first established a few hard and fast rock guidelines during an 11-month escape from jobs and “normal” life in the late 70s. By the second month into our travels, maybe in Vermont or some other abnormally tidy New England state, Walter had had it with helping me lug boulders back to the old green Chevy van that was home and transportation for our adventure. 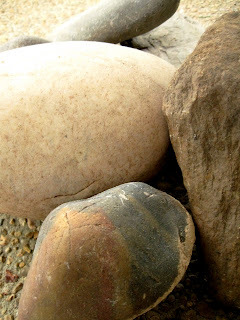 His edict: For a rock to join my collection, it had to be small enough for me to carry back to the van . . . by myself. Not that I always do carry my treasures back. There was that stream in Alaska, for example, that had sparkly rocks. This was not the same trip, by the way. This one was a cruise about two decades later. The rock I wanted was not within easy reach. Guess who waded out into the ice-cold water and brought back exactly the one I decided I simply must have? Not me, although I did have to pass the tote test. Yes, I could carry it. My patient husband took turns carrying the newest addition to my collection. That was extremely generous considering this particular geological specimen seemed to gain weight while we explored up and down steep roads and paths above Skagway. I doubt I will ever see anything similar to that rock experience in commercials touting the romance of cruising. But hubby knows me well. For me, a rocky romance was a good thing! 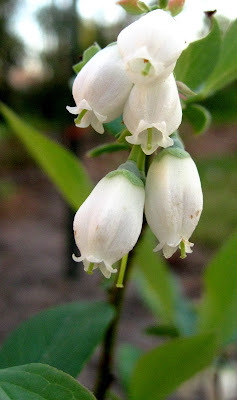 An invasive, fast-growing shrub has been winning the war for space and sunshine in our backyard. I think it may be Chinese privet, Ligustrum sinense, described in the online invasive plant atlas here. Now there is hope, however. 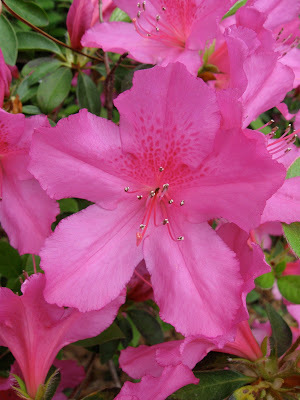 Regular visitors to this blog have probably already recognized that I am a sporadic gardener. Knowledge, skills, proper tools, regular care and maintenance . . . hunh? 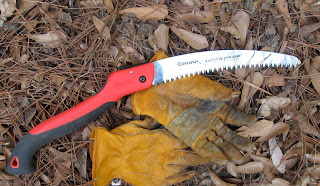 I have waged previous battles against the ligustrum hordes with an occasional bow saw and, when I can successfully whine and moan enough, a chain-saw wielding husband. 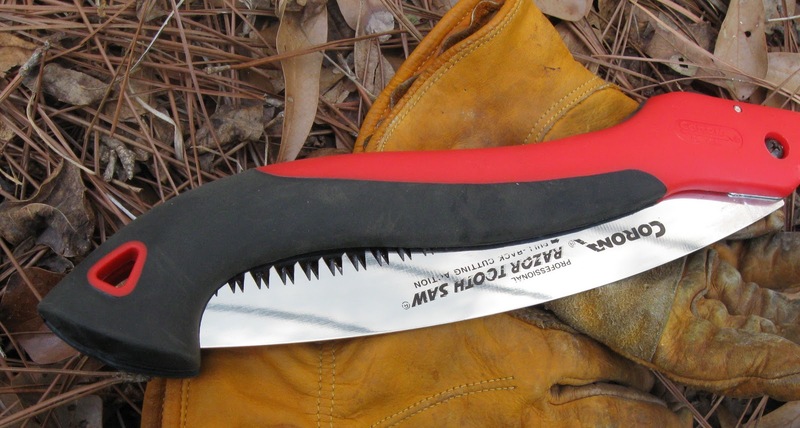 Mostly, though, I have used those lopper things. At battle’s end, I am aching and aggravated. The loppers are hard to get into position in all the closely packed trunks coming up. They are also just hard for me to manage when trunks are bigger than one-half inch diameter. And the trunks nearly always are bigger. Remember the word “sporadic”? Thanks to the blogging world, I am armed and have already won a small skirmish. 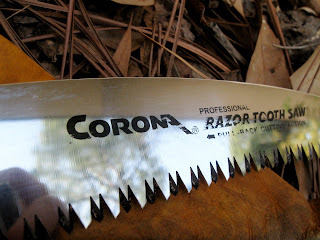 Several months ago, when I was in the non-gardening phase of sporadic, I read a blogger’s post on her new amazing folding razor tooth saw. Unfortunately, I did not bookmark it, but I filed that tidbit of information away. In late February, husband Walter turned me loose in the local Lowes for my birthday. I know that sounds like he keeps me caged up the rest of the time. Not true. He lets me out on holidays, too. The Lowes birthday trip is another post I may eventually do. Anyway, I didn’t find the same brand, but this one is amazing. It folds up for safety. The short blade and curve make it maneuverable in all those tight places. And the razor teeth . 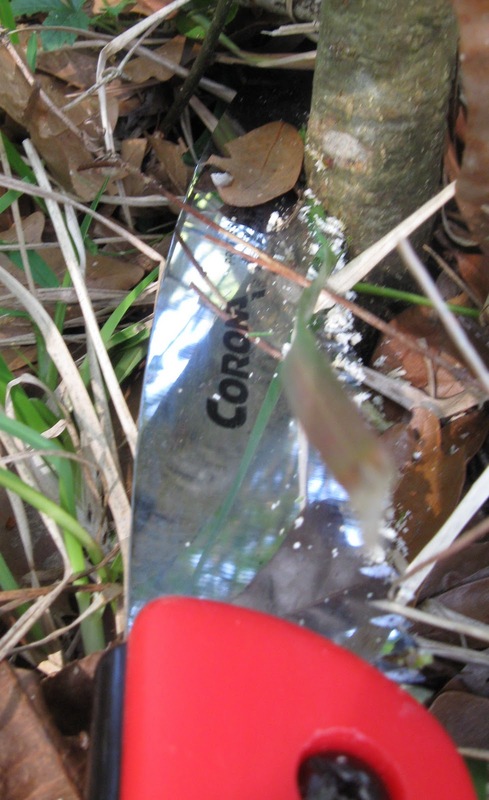 . . take that and that you nasty ligustrum! Oh, how I love Google! That sounded in my head like a hymn we used to sing in church. That doesn’t mean I am no longer in church. It does mean now we are “contemporary.” We don’t sing hymns any more. We sing songs popular Christian artists record, songs that I can never figure out any rhythm to and when to shut up and when to start singing again. Of course, there are still some good ones that crop up, some that have choruses I can manage and some that make me cry . . . from happier emotions, not from frustration. Okay, where was I. Google led me to the invasive atlas where I found this choice cutline under a photo attributed to James R. Allison, Georgia Department of Natural Resources. The photo pictures the clusters of black fruit produced by the prolific ligustrum. Well, our land is obviously disturbed. What land wouldn’t be disturbed and offended by ligustrum. I am disturbed by ligustrum. But I think James is wrong about the birds. The birds aren’t winter hungry. There is lots of stuff to eat around here in winter, including at our bird feeder. No, I think these are true birds of Mississippi, the most obese state in the union. Those birds like fast food and they are going to eat it, whether it is good for them or not! I think I better stop now. Have a great week! Your blog post published successfully! Those of you who use Blogger are probably familiar with that phrase. I get a thrill when I see that notice come up after I click the “Publish Post” button. It is sort of like my personal award ceremony announcement. Linda Skupien, your blog has published successfully! My own little Oscar night and I don’t even have to get out of my pajamas! And the thrill continues when I view the post on my blog. Oh, I have to go back and forth a number of times to edit. And then there are some weird typeface and spacing things that happen occasionally that I can’t seem to figure out how to correct. But so far I have survived intermittent Blogger frustrations. This post is my 236th since my inaugural post on November 3, 2009. I have recorded impressions and experiences that I want to remember about this phase of my life, and I have enjoyed becoming a citizen of the blogosphere. One of the best things about blogging is making new friends, gaining new insights from their posts, and sharing moments of their life journeys that often have a profound effect on the way I view my own day-to-day encounters, joys and challenges. But I have to wonder about that announcement “Your blog post published successfully!” Maybe I am being trained like Pavlov’s dogs with the instant gratification that the announcement supplies. Family responsibilities have contributed to my limited interactions on the Internet for the past few days. But the overriding reason for the absence of recent posts on Retirement Daze was that I have been struggling to climb out of the news vortex of disaster and conflict. The magnitude of human suffering and loss created a kind of paralysis in me. Nothing I could add via a post about the situation in Japan, Libya and other areas could help. And how could I possibly share light-hearted posts or even family challenges when they shrink to insignificance as the lives of so many have been, and still are being, torn to shreds? I have come to realize, however, that such emotional and mental paralysis is a convoluted self-centeredness. A single life will always be lived out within the context of larger issues and events. And some are called to help in dramatic ways; some in small ways. I had momentarily forgotten that lots of folks giving together can make a difference, even when those giving are individuals with limited resources. I had also momentarily lost touch with the fact that there is no distance in prayer. Prayer from afar counts. Two things helped with the climb out of the vortex. “As we pray for those in the northern provinces and all of Japan, know that I will be praying as well for you and others who report minor damage. After Hurricane Katrina on the Mississippi Gulf Coast, after awhile we realized that even those who escaped the incredible devastation and loss of loved ones, even they suffered the loss of a unique way of life, their landmarks, their sense of security, and the list goes on. The second was the sense of tangible, on-the-ground opportunities to help listed by Baptist Global Response here. There are other avenues of giving that do the same thing, I am sure, but BGR and my state Baptist convention’s disaster relief program are where I look first. And I also appreciated that BGR was looking to help in areas that were also devastated by the March 11 earthquake but are outside the tsunami impact zone where much of the initial news coverage focused. That’s it. Right now I am sitting on our screened porch, blogging once again. At least for now, I am out of the pull of that news vortex, even able to appreciate the visit of the beautiful little female cardinal that just came by to check for sunflower seeds. The time is always right to be thankful for blessings, and that includes small, everyday blessings. When we headed north for a visit to the Smoky Mountains recently, husband Walter and I anticipated that the trip would take us from the spring like weather of coastal Mississippi to more wintry environments. 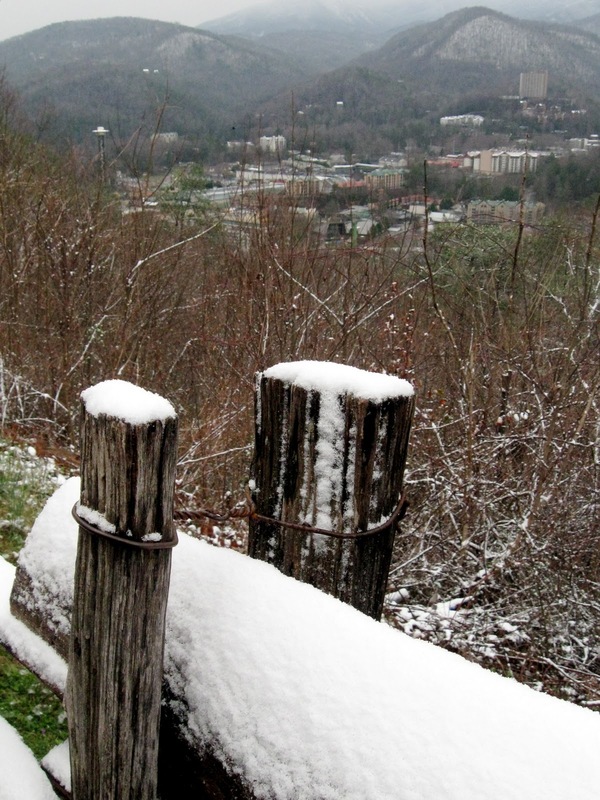 What we didn’t expect was to go from spring to winter in a matter of a few miles in the Smokies. A drive around the 11-mile Cades Cove loop in the Great Smoky Mountain National Park was blissfully lacking the summertime traffic. We enjoyed watching the abundant deer and wild turkeys, and they kept an eye on us. Throughout our drive, yellow daffodils created spots of sunshine in the cloudy day. 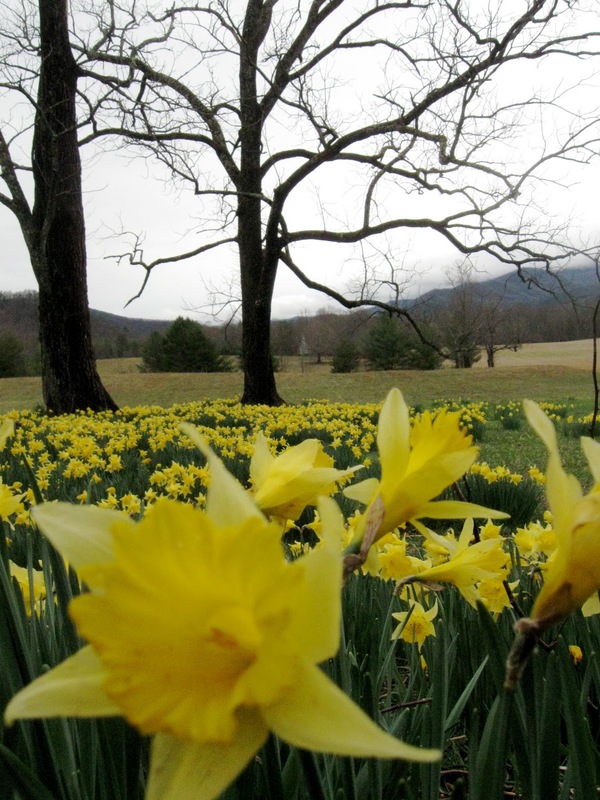 Daffodils were brightly colored evidence of former human residents of Cades Cove. Staff at the Sugarlands Visitor Center near Gatlinburg, TN, said the daffodils are not native to the Smokies. 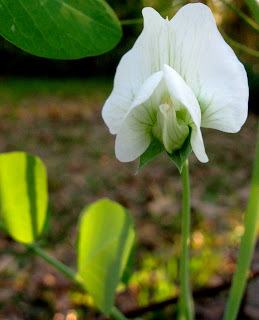 Settlers brought them in and planted them around their homesteads. The next day we headed to higher elevations via U.S 441, the road to Newfound Gap, elevation 5,046 feet, and the lowest drivable pass through the park. It straddles the Tennessee-North Carolina line and is on our usual route home and to and from some of our favorite spots in the Smokies. On the way we made a stop at Chimneys picnic area for a lunch of sandwiches and fruit. Cove Hardwood Nature Trail there is a great place to see the spring ephemerals that begin the Smokies’ annual extravaganza of wildflowers. The National Park Service site here says ephemerals appear above ground only in late winter and early spring, then flower, fruit, and die back within a two-month period. No flowers there for us this year. Last year we were in the Smokies in late March and early April, in time to see some of the early bloomers (pictured in my April 6, 2010 post here). Just a few curves above the picnic area we were greeted by snow flurries. 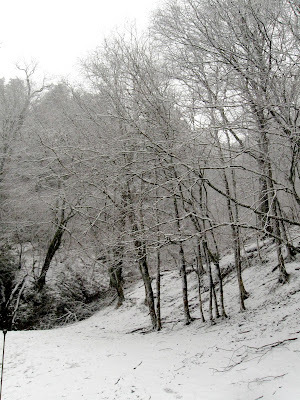 A little farther and the trees and bushes, newly dressed in white, created an enchanting monochrome fairyland. We continued on to Newfound Gap. Husband Walter parked and shot some photos. I stayed snug in our van. We retraced our way back to Gatlinburg, out of the snow and into a light rain. The next morning U.S. 441 to Newfound Gap was closed due to snow. The bypass above Gatlinburg gave us one more drive through a little snowy scenery as we headed toward Chattanooga and our alternate route home. We arrived home late Saturday, March 12. When we ventured outside Sunday, the first blooms of our azaleas greeted us. Spring weather again! - Sicki -- How did Blogger know that I had a sore throat that was trying to establish residence? - Souressa – So Blogger has determined I am not only of a sour, negative disposition, I am evidently a high-ranking sourpuss, the contessa, or countess, of the sourpuss domain. Hmpf! - Hatedus – Eek! That one is scary. Usually the verification process offers up some combinations that aren’t words but are close enough that potential definitions give me a chuckle. Even though the process can be irritating when my eyesight prevents identification of severely squished-together letters, I don’t mind. I assume the owner of the blog has had an experience similar to mine. When I first started Retirement Daze, I was getting comments that were probably computer generated. They included lots of garbage letters and symbols. But they also included pornographic suggestions, usually involving young celebrities. That stopped immediately once the word verification was in place. Thank you, Blogger, for that option. And thank you, blogging friends who persevere through the word verification gauntlet to comment! 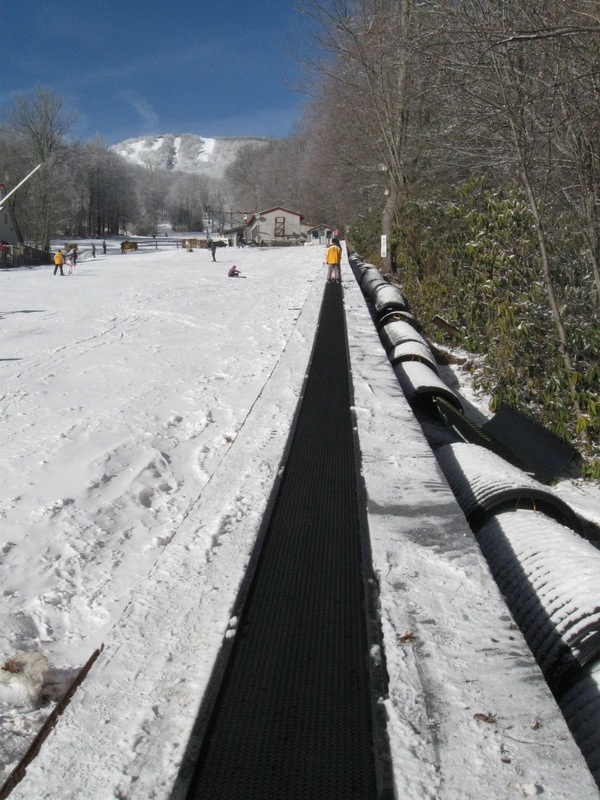 We knew we were taking a chance scheduling a ski trip to Boone, NC, so late in the season. But the weather was perfect. We experienced, and enjoyed, snow flurries when we arrived Sunday evening. The next day was blue skies and sunshine. 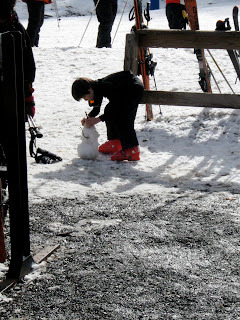 The cooperating weather was just one of the happy surprises on this ski trip. 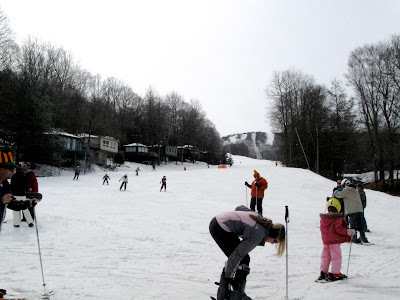 Another was that I felt better physically after skiing than I have on any previous trips. In years past at the end of the day I hurt everywhere. Before we headed out for this most recent trip, I had some concerns because I have not been exercising as in earlier years. And yet, this time I experienced fewer of the aches and pains I had in the past. Perhaps I was just more relaxed. Or maybe retirement “exercises” of playing with grandkids and gardening contribute more to fitness than I realized. I was still well aware that I had stretched some muscles more than usual. When I first tried sitting Indian-style*, there was definitely something going on where legs and torso connect. That lasted a couple days but by the third day I hardly noticed it at all. Our choice of timing did have some tradeoffs. Lines were short. Slopes were less crowded. 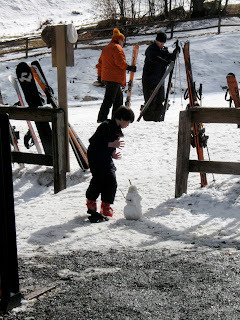 The snow, however, was wearing a bit thin in some areas, but Walter and I successfully avoided “rock” skiing. *Got to do some googling on this phrase. Does anybody else use "Indian-style" to describe sitting with your knees bent in front of you, ankles crossed and feet tucked under opposite side. Is the phrase now hopelessly politically incorrect? Whether it is or not, I think my attempt at describing the position is hopelessly confusing. 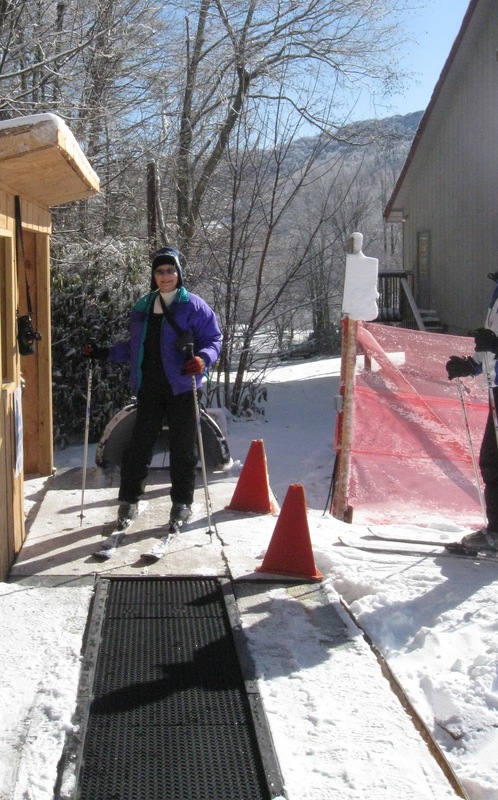 I did my share of people watching on a recent ski trip to Sugar Mountain near Boone, NC, with husband Walter. It was clear that, after a non-stop morning of skiing, my first run after lunch would be my last of the day. My legs were declining to participate. So I traded ski boots for comfy shoes and retreated to the lodge’s deck to revel in the sun, blue skies, crisp fresh air and, of course, people watching. My people watching resulted in the images below. I am counting on the backlighting to obscure the subject’s identity. The young snow artist above was oblivious to skiers and snowboarders coming and going around him. His entire body radiated his determination to stabilize the snowman he had created. Success at last! Snow artist sets his toppled snowman upright. The young artist adds finishing touches. How many adults still have the childlike ability to submerge themselves totally in an activity that interests them? And will the little snow artist retain that ability once he begins texting and tweeting? I just survived another skiing expedition. Husband Walter loves to ski, or at least loves the challenge of hitting the slopes for a day every other year or so. He and our sons are well coordinated and athletic. I, on the other hand, can barely manage to walk and talk at the same time. I enjoy the travel, scenery and general vacationing (you know . . . eating, eating, eating!) that come with a skiing trip. But the ability to enjoy the actual skiing activity has developed over time. I have learned to apply the mantra my eldest son has recited to me periodically: You have to manage expectations. Goal #1: Don’t cause injury to anyone, myself included. Goal #3: Keep my sense of humor operating on high. How did I do? Goals #1 though 4, check, check, check, and check. Linda prepares to ride the magic carpet. Don’t I look confident as I prepare to get on that people mover thing the Sugar Mountain Resort folks call the “magic carpet”? It’s in the area reserved for “learners.” Or was that “slow learners”? I shuffled onto that narrow moving conveyer belt, leaned forward and kept my feet planted according to instructions. About a third of the way up, it stopped. I shifted my weight, moved my ski just a teensy little bit and ackkkk! The conveyer belt started up. I toppled over. They stopped the thing. The guy who had taken my picture ran out and helped me up, asking me several times if I was hurt. I wasn’t. He also assured me that falls didn’t count in the magic carpet area. “That’s why it’s called the magic carpet,” he said. And even better, I met goals 1, 2 and 3! I can’t say that the experience met goal #4, but I did accomplish #4 later. Now you can see why I prefer to set manageable expectations for myself. Meeting my goals was as easy as, well, as easy as falling off a log -- or a people mover. 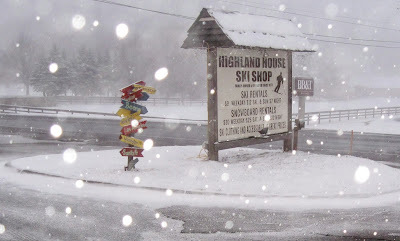 Husband Walter posted about our day skiing here. I’ll be posting more later. Right now, though, I’ve got to go bask in my sense of accomplishment for awhile. 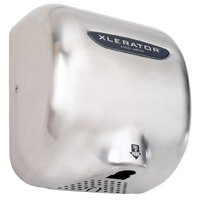 Has anybody else been encountering those relatively new (at least to me) blow-dry hand dryers that are cropping up in public restrooms? They quite literally blow the older models out of the running when it comes to decreasing drying time. All of the brands I found information about fell in the 70 to 90 decibel range, with the higher decibel levels potentially causing damage with long-term exposure. Since people don’t ordinarily spend 8 hours or more continuously drying their hands, such exposure is unlikely. What I couldn’t find in this quick search is whether or not being in a tiny room with one of these monster dryers bouncing sound off the walls actually increases the decibels to a harmful level. Or how about two of these dryers in operation at the same time in a restroom facility that I am sure was actually designed as an echo chamber? Regardless of what the experts say, I may just add ear plugs to the other “necessities” that I lug around in my purse. Okay, that was my rant for the day. I am determined that the rest of my weekend shall remain rantless. *Photo borrowed from manufacturer's Web site here. Two things converged today to remind me about the llamas that serve as pack animals on the Tennessee side of the Great Smoky Mountain National Park. Thing #1--Husband Walter and I are preparing for an early spring trip to the Smokies. Thing #2—Ginny at Let Your Light Shine posted photos and text here about alpacas she visits occasionally near where she lives. 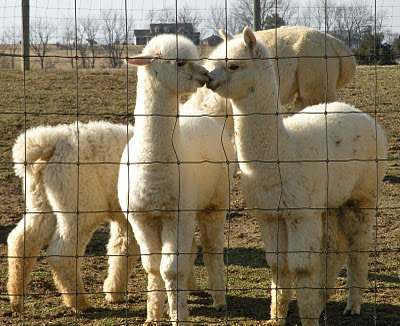 The cuddly looking critters, especially the babies, elicited comments from her readers about the alpaca species’ relationship to llamas. And that led me on a search to find out if llamas are still in use in the summer to haul supplies up to the lodge near the top of Mt. Le Conte in the Smokies. I found this entertaining (to me) video about the llama train. 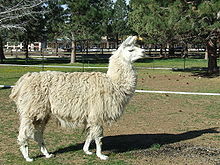 It was posted last summer by the Great Smoky Mountain Association, so I take that to mean the llamas will be strutting their stuff again in summer 2011. We have never stayed at the lodge, but for a number of years a whole group of Skupien relatives would meet and camp in the Smokies for about a week. The hike up Mt. Le Conte was one of the things we loved. According to Wikipedia, it is the third highest peak in the national park and the tallest mountain in Tennessee, rising 5,301 ft (1,616 m) from its base, near Gatlinburg, TN (1,292 ft/394 m). The route we chose to hike Mt. Le Conte was always the Alum Cave Bluff trail. The views on the way up and at the top were great. We would occasionally see one of the mountain’s black bears. 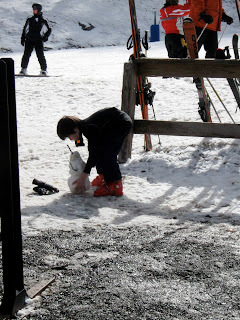 At the lodge there were potties and a hand pump for refilling water bottles. Available for purchase in the lodge’s recreational room were candy bars along with tee shirts that proclaimed “I hiked Mt. Le Conte!” And the rocking chairs on the porch were a great place to recover before heading back down the mountain. I’m not sure if that kind of welcome mat is still out for non-guests. We haven’t made that hike in a number of years. We will be making a second trip to the Smokies in July, once again meeting up with family. Maybe this year we will tackle Mt. Le Conte. Or maybe not. I recall the last time Walter and I hiked Le Conte, getting out of chairs and then standing up straight were strangely difficult for a couple of days! Notice—Before any reuse or distribution of the Mt. Le Conte text or llama photo attributed to Wikipedia, please check the license terms at here. 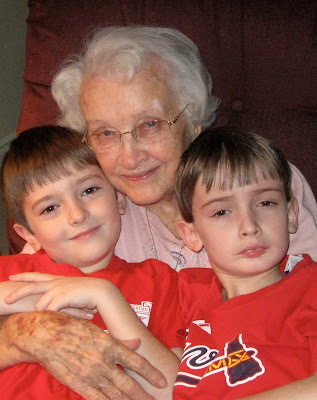 We are thankful that our grandchildren have a chance to know my mother and husband Walter’s mother. Those chances for in-person visits are limited by geography and the diminishing stamina of our mothers. 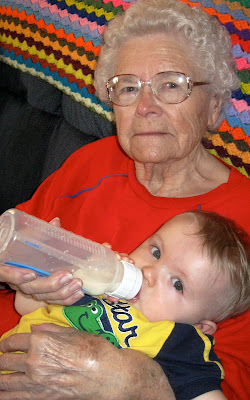 Recent visits by our grandchildren included our helping with the great-grandmother connection. 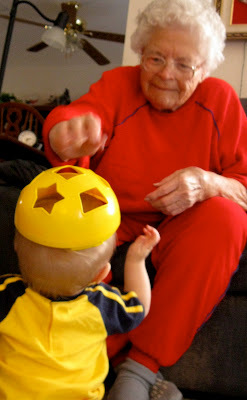 Our youngest son’s little one, 9-month-old Walker, soaked up attention from his great-grandmother, my husband’s mother. It was his first visit to Grandma Sugar’s home. Walker and Grandma Sugar entertain each other. A few days later it was off on a 90-mile jaunt with daughter-in-law Sarah and the Fab Four, our other set of grandchildren, to visit my mother. Mamaw Carpenter soaks up the attention of her oldest great-grands, Luke, 8 (right), and Nate, 6. A count of my blessings has to include our mothers who cherish visits from their high-energy grandchildren, and sons and daughters-in-law who make conscious efforts to carve out time for visits to their children’s great-grandmothers.